Toronto Dogs Directory: Peter Worthington - Ontario Government Should Revise Its “See-No-Wrong” Policy Towards The OSPCA. Peter Worthington - Ontario Government Should Revise Its “See-No-Wrong” Policy Towards The OSPCA. TORONTO - This is the story of two dogs named Rocky — one a 16-year-old Husky which was unnecessarily seized and killed by the OSPCA this summer, and the other being feted by the OSPCA at a fund-raiser on Nov. 28 at Roy Thomson Hall. The owners of the assassinated Rocky (OK, euthanized) feel the fund-raising is being used to confuse people and make them forget the horrendous botch-up with their dog. Maybe, maybe not. Certainly the OSPCA Rocky is a nice story of restoring a mange-riddled dog to normality, though calling it “a shining example of the life-saving work the OSPCA performs every day,” seems a bit of a stretch. Pity their “life-saving work” was nowhere in sight for the Tramontin’s Rocky. When a neighbour phoned Toronto Animal Services (TAS) that a dog was barking in the Tramontin’s backyard (Gianna Tramontin is a school teacher), the animal was picked up and delivered to the OSPCA in Newmarket and was promptly euthanized. Ms. Tramontin was appalled that Rocky had been killed without anyone phoning her or her vet. The OSPCA said the dog had no collar, no phone tag, no microchip, and was in bad shape — something Rocky’s vet, Heather Hannah, disputes. OSPCA’s version that Rocky was in pain, dehydrated, urine scalded and showed signs of a neurological condition. 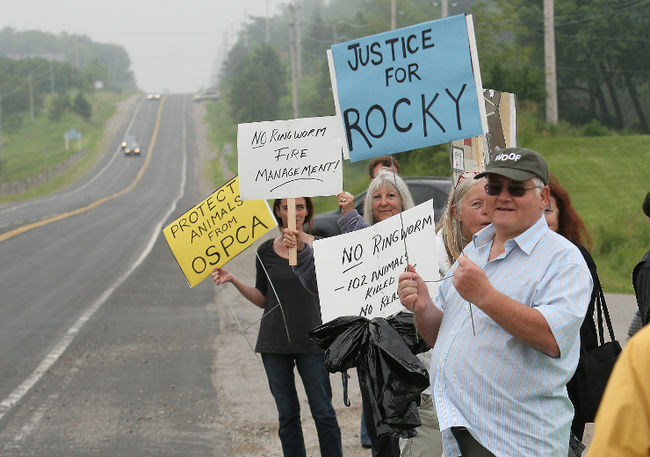 After killing Rocky, the OSPCA said the dog was without collar or identification. No phone number, no microchip when they scanned it. She says Rocky was her “patient” for 14 years. And when Rocky’s body was turned over to the Pets at Peace cremation services, the collar was on, the rabies vaccine tag showed the vet’s phone number and a scan showed the microchip in the dog’s shoulder — and not “drifted down” to the animal’s paw as the OSPCA claimed. OSPCA changing and amending its story, especially when the media got onto it. Dr. Hannah has a valid point. Part of the problem with the OSPCA lies in it being a charity with policing powers without accountability. Like many, she doesn’t think a registered charity should have police powers. 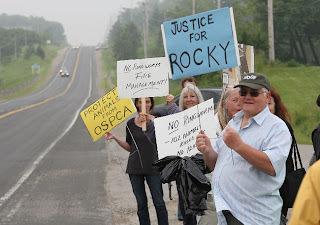 Veterinary Facilities, wonders if presenting another dog named Rocky as an OPSCA “success story” to raise money, is a ploy by OSPCA “spin doctors” to wipe from the public’s mind, the disgraceful treatment their Rocky received. Ontario government should revise its “see-no-wrong” policy towards the OSPCA. Meanwhile, the other “Rocky” will be glamourized and fussed over on Nov. 28, to raise money for his saviours.